Facebook friend Melissa Hale posted on my page about her discovery of an unusual feather. “I think I have found a feather from a yellow-shafted flicker,” she wrote. “Do we even have these around here?” She noted that she has heard several species of woodpecker around her home and added that daughter Heather has seen quite a few different woodpeckers around their home. Photo by Donna Dewhurst/U.S. Fish & Wildlife Service The extended wing of this Northern flicker shows how the eastern race of this woodpecker is known as the “yellow-shafted” form. I posted back that she probably had found a flicker’s feather. The name “yellow-shafted flicker” is one of a great many common names for this medium-sized woodpecker, which is known by birders as the Northern flicker. The phrase “yellow-shafted” describes the Eastern race of this woodpecker, which is replaced in the western United States by the “red-shafted” flicker. In reality, both the yellow and red-shafted birds are considered by experts to be the same species. The yellow feathers in Eastern birds are found under the wings and on the tail. The yellow, or red, sections of the wings are most visible when the bird is in flight. I’ve seen both forms of this woodpecker, observing the red-shafted form of the Northern flicker during trips to Utah in 2003 and 2006. Melissa described the feather as “one of the most beautiful feathers I have ever seen,” which is not too surprising. Most of the region’s woodpeckers are black and white birds. The Northern Flicker, on the other hand, shows considerable color— for a woodpecker. While flickers can be found during all seasons in the region, this woodpecker is one of the migratory ones. I see the most Northern flickers during fall migration. This woodpecker is one of the few of its kind that migrates to warmer climates during the colder months, although the species is usually not absent from the region in the winter season. Photo by U.S. 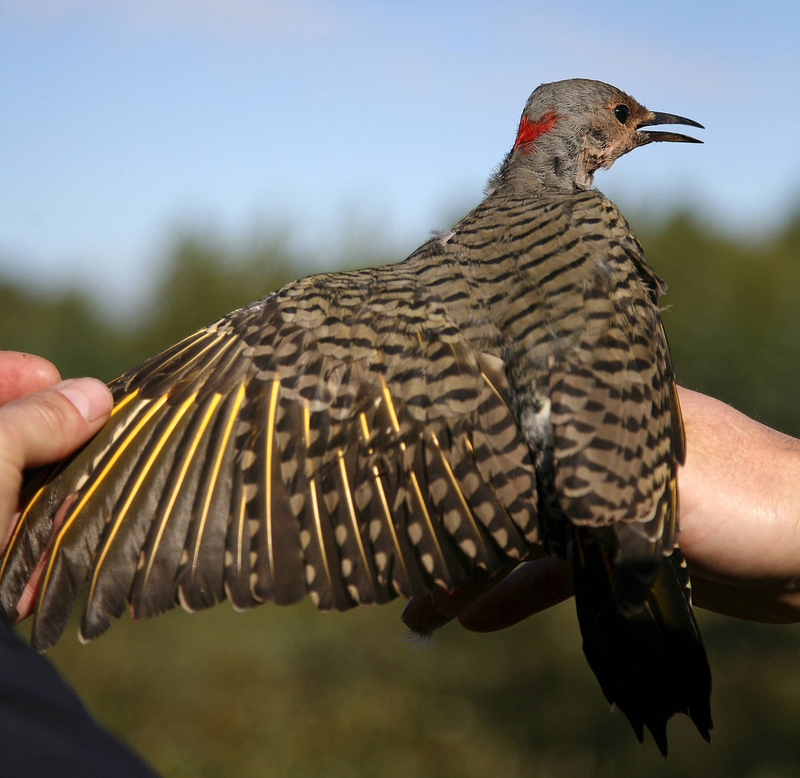 Fish & Wildlife Service The Northern Flicker resides in open habitats near trees, including woodlands edges, suburban yards, city parks and orchards. As mentioned earlier, this is a woodpecker with many other common names, including yellow-hammer — a popular name in the Deep South — and harry-wicket, heigh-ho and gawker bird. The Northern flicker is also the only woodpecker to serve a state — Alabama — as an official bird. The flicker earned this distinction back in 1927. Soldiers from Alabama who fought for the Confederacy were nicknamed “yellowhammers” because of their grey-and-yellow uniforms, which matched the colors of the bird. Incidentally, Alabama was one of the first states to ever name an official state bird. The Northern flicker — both the yellow- and red-shafted races — is not the only flicker in the United States. The gilded flicker inhabits many of the deserts — Sonoran, Yuma and Colorado — in the United States. Of course, trees are scarce in deserts, but that hasn’t proven an obstacle for this woodpecker. The bird is closely associated with saguaro cactus. Other desert dwellers depend on this woodpecker. Once the flickers are no longer making use of their nest and roost holes in the multi-armed cacti, other wildlife moved into the chambers. The Northern flicker is an enthusiastic drummer, pounding loudly on the sides of trees with its stout bill. The purpose of the drumming is to communicate with mates and signal potential rivals that they’re intruding. Toward that objective, flickers sometimes substitute metal utility poles or the sides of buildings for the trunks of trees. In addition to drumming, the flicker also employs a variety of loud vocalizations that are fairly distinctive. A loud, repeated flicker, often translated as “wicka-wicka-wicka,” is similar to the cluck-like call of the larger pileated woodpecker. The flicker is also known for emitting a sharp, loud “kleeer” call can be heard from a considerable distance. 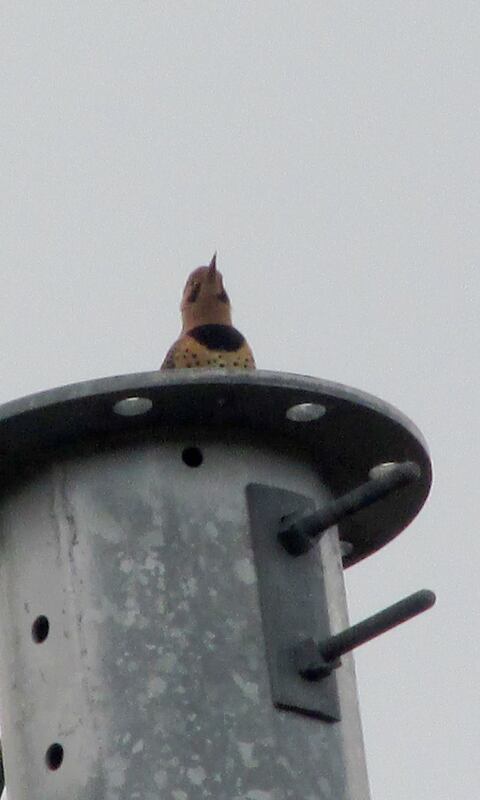 Flickers are probably most vocal during the spring months. If you search for flickers, however, don’t concentrate all your scanning on tree trunks. These woodpeckers spend a lot of time in field or on lawns in search of insect prey, which mostly consists of ants and beetles. Flickers also eat seeds and fruit, and these woodpeckers will also visit feeders for peanuts, sunflower seed and suet. The adult flicker is a brown bird with black bars on the back and wings. A distinctive black patch occupies the upper breast, while the lower breast and belly are beige with black spots. Males can be identified by a black or red mustache stripe at the base of the beak. They also have a red stripe on the back of their gray heads. The flicker’s dark tail is set apart from a white rump patch that is conspicuous when the bird takes flight. Photo by U.S. Fish & Wildlife Service A Northern Flickers looks out from its nesting cavity. The Northern flicker, as either the red- or yellow-shafted reach, ranges across the United States and Canada. The flicker also ranges to Central America, Cuba and the Cayman Islands. Known scientifically as Colaptes auratus, which can be roughly translated as the “golden woodpecker,” there are about a dozen species of flickers in North, Central and South America, as well as the Caribbean. A couple members of the flicker clan are now extinct. The human introduction of cats and goats to Guadalupe Island, offshore from the western coast of Baja California, Mexico, led to the extinction of this woodpecker in 1906. 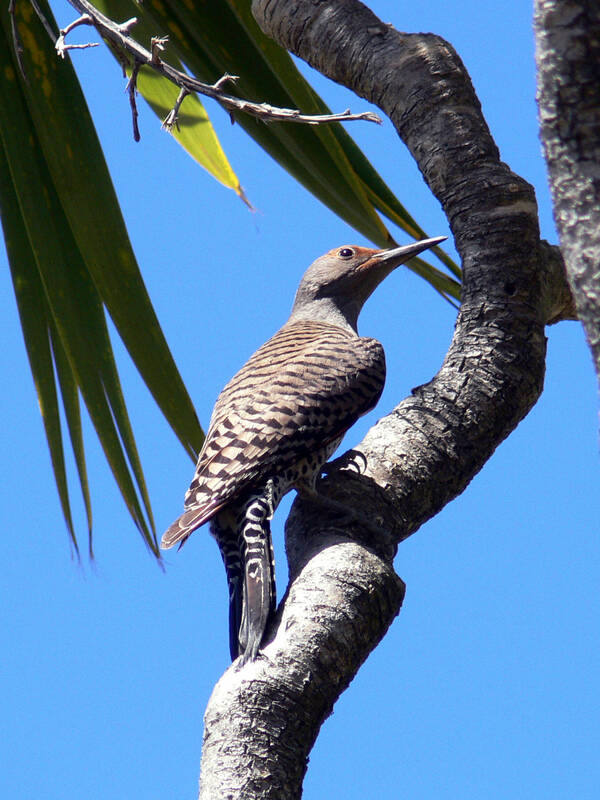 The Bermuda flicker apparently died out centuries ago, although a few may have lingered into the 17th century. John Smith, the early explorer associated with the Jamestown colony of Virginia, may have written of the Bermuda flicker in a journal recording his voyages. 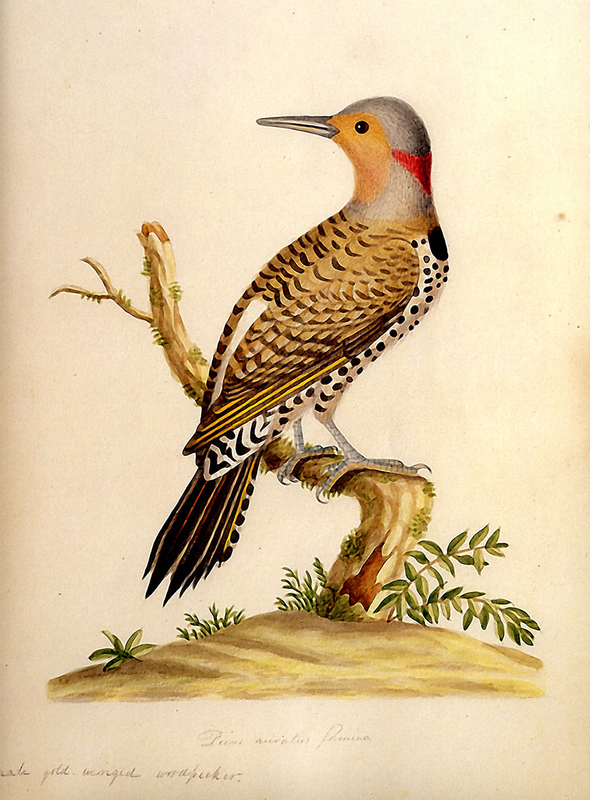 English-born John Abbot explored southeastern Georgia, collecting specimens and painting birds such as this Northern Flicker during the Revolutionary era in Colonial America. 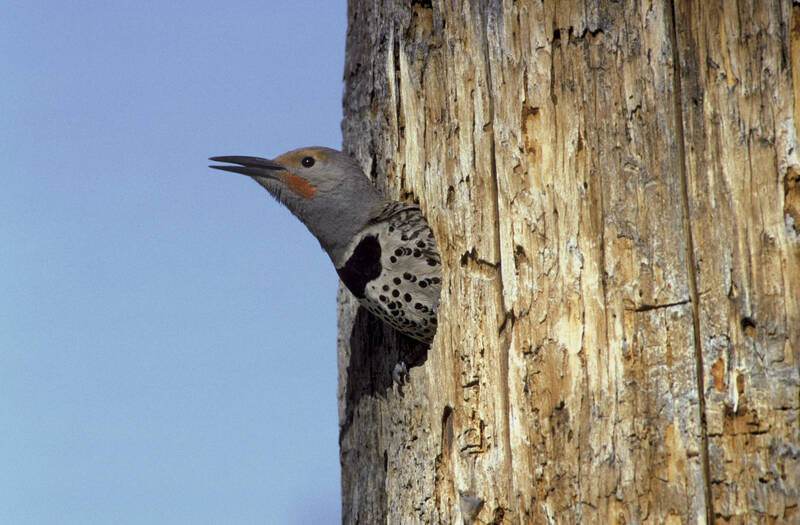 Look for Northern flickers in fields, orchards, city parks and well-planted suburban yards. These woodpeckers are usually not too shy around human observers and will sometimes allow for extended observation. If you’re even more fortunate, you could find one visiting your feeders. This entry was posted in Birding, Birds, Northern Flicker, Woodpeckers and tagged Birding, birds, Bristol Herald Courier, Bryan Stevens, Carter County Compass, Elizabethton Star, Erwin Record, Feathered Friends, McDowell News, Northern Flicker, Our Fine Feathered Friends, The Erwin Record, Woodpeckers on February 28, 2016 by Bryan Stevens.